There is option for change your dinner plan to Tsubohachi dinner course. Enjoy yourself with others and leave memories here. The dinning bar Tsubohachi offers various courses with different prices and for different number of persons. Affordable open bar plan is available. 아침이 빠른 고객님께 추천! 1박플랜 4,260엔(세금별도)～ 화실(일식)・양실(양식)・화양실(복합식) 여러가지 타입의 방을 고르실 수 있습니다. Wonderful breakfast plan. Several types of breakfast included. 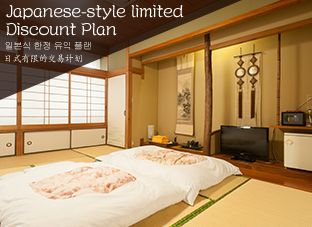 From 4,815yen(taxable) Make choice between Japanese style room, western style room, mix style room. 아침을 제대로! 선택가능한 조식 포함 플랜 4,815엔(세금별도)～ 화실(일식)・양실(양식)・화양실(복합식) 여러가지 타입의 방을 고르실 수 있습니다. 쿠오카드 포함 플랜 쿠오카드1,000엔、2,000엔 포함 플랜 쇼핑에 편리합니다. 합리적인 인기있는 플랜입니다. 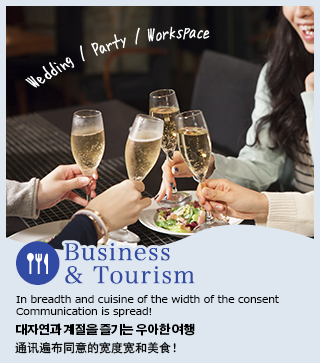 【화실】１실３분이용한정 합리적인 플랜 1분 3，797엔(세금별도)～ 넓은 방에서 여유롭게 가족, 친구들과 시간을 보내세요 다다미방이므로 작은 아이와 함께 오신 분들도 안심할 수 있습니다. (여성 2명 한정)조식포함 디럭스 트윈 플랜 1분 4，630엔(세금별도) 최상층의 전망좋은 방입니다. 창문으로 『츠츠지 공원』이 보입니다. 넓은 방에서 여유롭게 시간을 보내세요. (For customers 60s and above)Deluxe twin beds room plan. Breakfast included. 4,630yen(taxable)/person ※As a person High floors, big windows and very nice view. Have a full view of the tsutsuji park(つつじ公園). Large room, best for refreshing and relaxing. Make reservation now. 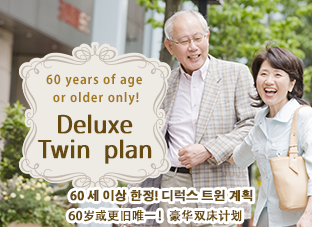 (６０세 이상 한정)조식포함 디럭스 트윈 플랜 1분 4，630엔(세금별도) 최상층의 전망좋은 방입니다. 창문으로 『츠츠지 공원』이 보입니다. 넓은 방에서 여유롭게 시간을 보내세요. Long stay plan, with dinner included. Dinner included, various types of courses available. 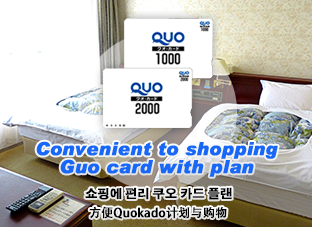 Customize for each customers’ staying plan. 장기숙박 플랜 저녁을 포함하는 합리적인 플랜 저녁을 포함하는 합리적인 플랜 저녁을 선택하는 것도 가능합니다. 여러가지 경우에 대한 대응이 가능합니다.